Last year on New Year's Eve I posted my top 5 favorite recipes I made in 2010, and I'd like to do the same for 2011. I actually intended to share more recipes this year, and more regularly, so I apologize for the lapses in blog posts here and there. Often I make something new, really like it and want to post the recipe, but then I never quite get around to making the same thing again or don't have time to take all the pictures. Then there are times when I decide to make a recipe specifically for a blog post, and it's disappointing. Sometimes I go ahead and share the recipe anyway, especially if I think I did something wrong or I feel like I'm long overdue for a post. Maybe in 2012 I'll have enough to do a top 10, but this year I'm sticking with just 5. I would like to point out that the gluten free chocolate chip cookies from Elana Amsterdam's Gluten-Free Almond Flour Cookbook is a recipe I featured this year, and it's without a doubt a favorite and possibly the recipe I make most often, but I've been making it since 2010, so I didn't consider it for the top 5 of this year. Also, I didn't consider any recipes that aren't gluten-free. These are MY favorite recipes, after all; I have to be able to eat them. 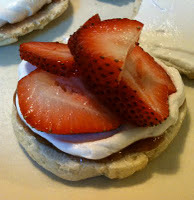 So, without any more rambling, here's the countdown of my 5 favorite recipes of 2011. Number 5 is the gluten-free Strawberry Shortcake I made for the Driscoll's Strawberry Shortcake Day promotion. These are definitely best consumed the same day they're baked. They get stale very quickly. I did more than just top them with strawberries, though. I also enjoyed them with lemon curd and raspberries, and they're also pretty dang yummy smeared with Nutella. 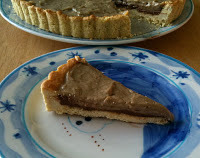 The gluten free Mud Pie was really an experiment, and I was pleased enough with the results to consider it number 4. I know it doesn't look all that appetizing, and I do want to make this recipe again, just to see if I can improve its appearance. The crust is yummy and works with any kind of filling, so it's a great recipe to know. The Carrot Date Muffins recipe I made in November is my 3rd favorite, only I like the way I made them better than the original recipe. They're delicious naked, but when topped with some cream cheese frosting you'll swear you're eating carrot cake. 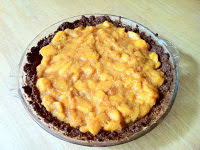 In 2nd place is the Nutty Crust Peach Pie. Here's an example of a recipe that didn't come out very well, due to the burnt crust edges, and me subbing some pecans for almonds didn't work out quite as well as I'd hoped. Peaches and pecans go together fine, but this crust got soggy on me, and it that's not been an issue when I use all almonds. Still, it was delicious. There's a reason I went ahead and posted that cornbread recipe yesterday, even though I didn't have step-by-step photos, or really any decent pictures of the cornbread muffins. I had to get that recipe up because it's my top number 1 favorite of 2011. Here again, I like the way I made it better, but I'm not all that fond of sweet cornbread, especially when I want to make stuffing with it. I want to know about other great recipes people made this year, gluten-free or not. Do you have a list of favorites? Please comment and let me know.